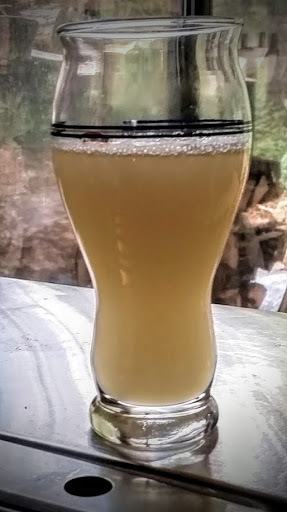 Several years ago I envisioned a Berliner Weisse style beer brewed using a sourdough culture instead of the traditional brewer’s yeast and Lactobacillus delbrueckii cultures. The risk seemed low since Berliner Weisse is a sour beer style, and it is low alcohol so there would not be much lost in ingredients if the experiment failed. Still, brewing takes time and effort and I was therefore reluctant to spend the time on something that could end in a dismal failure. Time marches forward, of course. Almost every time I was feeding my sourdough cultures or baking bread I would smell the welcoming aroma from the happy marriage of wild yeasts and bacteria and I would think of my dream to brew this beer. Eventually I worked up my nerve to do it, and the results appear to be a great success. The first step in the process was to get the sourdough culture as active as possible. From my cultures, I selected the Camaldoli culture which was collected from the area of Naples, Italy. I have been using two Italian cultures for baking bread and pizza dough for a long time now (and sourdough baking for even longer). I selected Camaldoli based on its spicy, fruity aroma. Even with a long period of autolysis, it does not generate sharp alcohol or solvent-y aromas. I needed to get the culture very active because I know that sourdough is a symbiosis of yeasts and bacteria. When the culture is very active, the yeast is dominant. I needed this to allow the beer to properly ferment, but I also needed the bacteria to play a strong supporting role to round off the yeast fermentation with a sharp acidic twang developed through a long aging process. 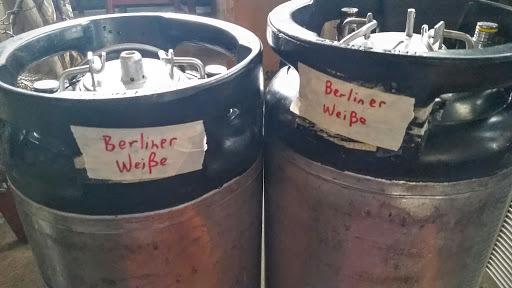 Long aging is a tradition with Berliner Weisse. This seems counter-intuitive for a low alcohol beer, weighing in at only around 3% ABV. 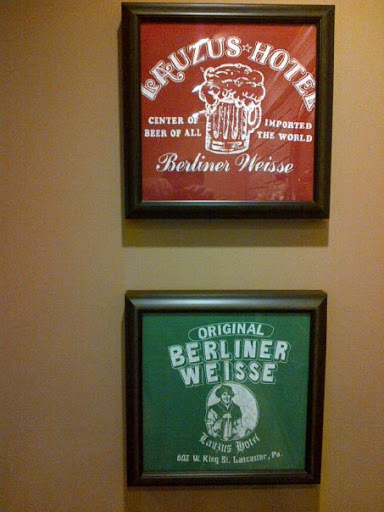 Records show that Berliner Weisse likely was first brewed in the 17thcentury. As the name suggests, it is a style that originated in Berlin. While the name “weisse” or “weiẞe” refers to the beer’s white color, it is also a wheat beer with some traits in common with the southern German weizenbier. German beers brewed with wheat were originally reserved for the elite class, and as their popularity spread a tax was applied to beers brewed with wheat. The brewers of the north defined their own style with lower alcohol, high carbonation, and a lactic tartness. The result is a very light and refreshing drink. Berliner weisse is often served over ice in a bowl-shaped goblet. Some like it with a bit of flavoring added. 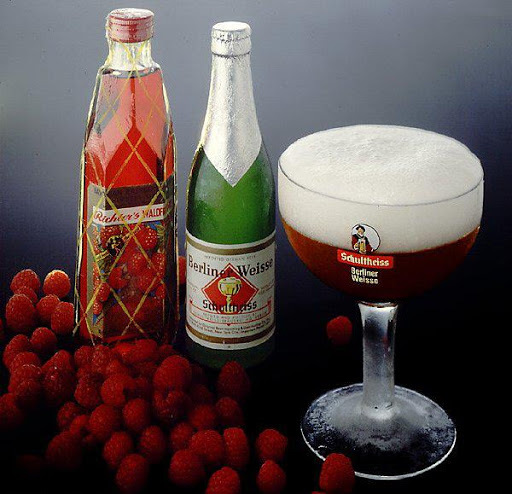 Traditional flavors are Waldmeister (essence of the woodruff herb) which is green, Limon which is yellow, and Waldfrüchte (raspberry essence) which is red. The colors of a stoplight. Of course it may be enjoyed just as is with no additions. I like it whichever way it is offered to me. Some places will scoff at adding anything while others insist on their adulterant of choice. One of my original favorite places to explore beer styles was the Lauzus Hotel in Lancaster, PA. The proprietor, Wilhelm Lauzus, prided himself on offering Berliner Weisse. My friends and I would usually have one, and Bill would make a grand performance of preparing the goblets of beer with great care and precision. He always added Waldfrüchte, then ice, and gave a brisk stir to froth up the top and mix in the syrup. Handed over the bar with a satisfied flourish and our thirsts were quenched! Memories of the tastes and smells that go along with those images hold a special place in my mind. I set out to make 10 US gallons of Berliner weisse. 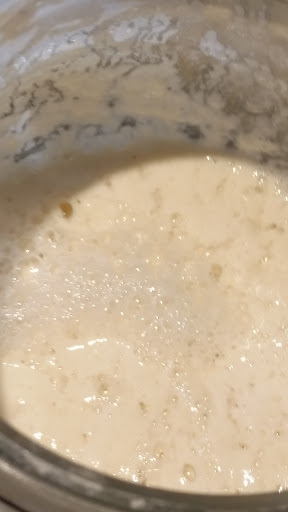 I had a very bubbly sourdough starter made with about a tablespoon of the Camaldoli culture a cup of flour (I used Italian tipo 00 because it is what I normally have on hand) and enough filtered tap water to make a loose slurry. The starter was active enough that it would foam up in about 2-3 hours. The grist for this beer was 5.1 pounds of German Weyermann weizen malt (malted wheat) and 5.1 pounds of American 2-row malted barley. I crushed the malts in my three roller grain mill. Sometimes I grind wheat separately, but I did not do that this time and it looked like my mill was set properly because both the wheat and barley were nicely crushed. Because the malts were such a small amount and I was planning on a multi-stage infusion mash, I decided to do the mash in a pot on my kitchen stove. I heated 17 quarts of filtered tap water in a large stockpot to 104F. Stirred in the malts. Stabilize the pot to 104F and hold 10 minutes. Heat to 122F and hold 35 minutes. Heat to 144F and hold 10 minutes. Heat to 147F and hold 20 minutes. Heat to 162F and hold for 30 minutes. Heat to 167F and hold 10 minutes. Next I filled the lauter tun (a converted steam fired soup urn with perforated false bottom) with 180F water up to the bottom of the false bottom. This underlets the screen and prevents the mash from getting stuck. The 180F heat also takes up the heat of the steel so the mash is not unduly cooled. I carefully transferred the mash to the lauter tun and added more hot water to get the temperature to 169F. I ran new hot water in on top of the mash while draining off from below. 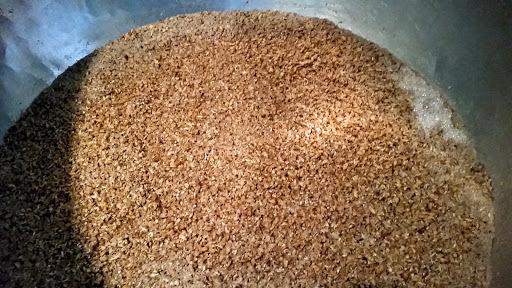 I added the cloudy runoff back on top of the mash until the runoff runs fairly clear. Clear runoff is added to the boiling tank while new hot sparge water is fed on top of the mash bed. I continued this until I had collected 15 gallons of wort. 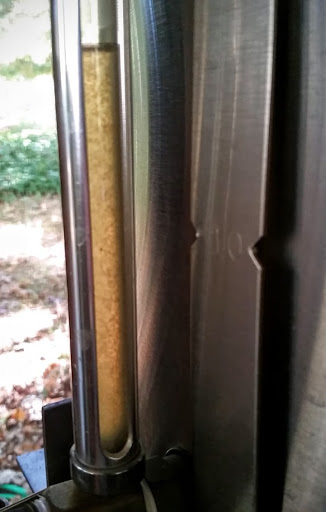 The boiler burner was fired as soon as I had 4-5 gallons collected in the boiler. When the wort began to boil, I added the first hop addition. 12 grams of German Hallertau Mittelfruh hop pellets with 3.5% alpha acid. This style of beer has very low hops, so I wanted to go with something that would meld well with the spicy, floral expression of the sourdough character. I kept a very vigorous boil going because I wanted to encourage proteins to coagulate as break to help clarify the resulting beer. 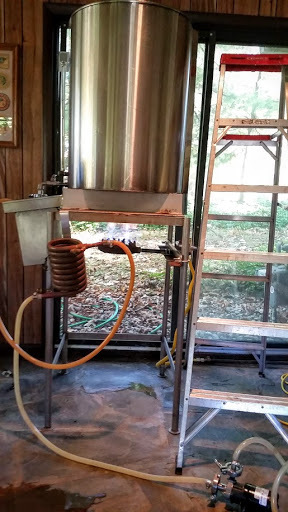 I also needed to reduce the volume down to about 12 gallons in order to yield 10 gallons of finished beer. About 15 minutes before the end of the boil, I added another 12 grams of Hallertau Mittelfruh hops. The beer reached the end of its boil at about 120 minutes. I cooled a sample and tested the specific gravity with a refractometer. Right on target at 8 degrees Plato. The wort was chilled and transferred into two glass carboys for fermentation at ambient temperature of 60F. I pitched half of the sourdough starter in each carboy. The next morning, signs of active fermentation were forming; a bit more lag than I normally see with brewing yeast. 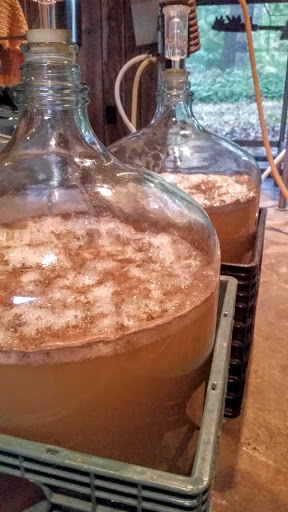 A steady ferment continued for a week, at which point the beer began to settle and clear. I racked the beer into 5 gallon kegs, primed and added some head pressure CO2 to hold the lids during the early stage of conditioning. Of course I sampled the beer during the transfer process. It was an extremely pleasant surprise! The beer was very pale with a slight haze. A brilliant white head. An aroma that was full of tropical fruits: guava came to mind first, then banana, strawberry, and citrus. Also a floral, peppery aroma. The taste was bready, mild, fruity, slightly spicy. Very pleasant and refreshing to drink. A slight tart finish left me wanting more. I was very excited! Now all I need to do it wait for the beer to reach its full potential. I am hoping to serve one keg in December, and let the other one go until next summer. I am already thinking of the next styles of beer that could be made with this wild, wonderful culture. Maybe a Belgian wit or saison perhaps?